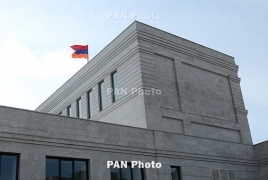 Armenia welcomes the decision adopted by Italy's Chamber of Deputies with regards to the Armenian Genocide, which reaffirms the country's commitments and obligations under the Convention on the Prevention and Punishment of the Crime of Genocide," the Foreign Ministry said in a statement on Thursday, April 11. "The decision adopted by the Parliament of Italy is yet another important input to the efforts of the international community to respect and restore the rights of the Armenian people who suffered the Genocide," the statement says. "The act of raising of awareness of the Armenian Genocide by the Italian Parliament is an important message aimed at the prevention of genocides and crimes against humanity." The Lower House of Italy's parliament on Wednesday approved a motion calling on the Italian government to officially recognise the Armenian Genocide and raise the profile of the issue at the international level.